John, who opposed current president of the SVGFF, Venold Coombs, at the September 24 elections, is questioning whether that was the underlying reason for the non-sanctioning. John disclosed that he had written to the SVGFF requesting to host the tournament from January 5 to February 17, 2013, as well as the National Lotteries Authority for use of the Victoria Park. John said from his knowledge, the SVGFF then did not make any request for the use of the venue. But, John said he learned of the executiveâs decision at a meeting at the SVGFFâs office on December 5, involving John, Noel Jackson of the SVG Over 35âs organisation, SVGFFâs general secretary Trevor Huggins, Coombs, first vice president Julian Small, and third vice president Paul Boucher. Huggins told SEARCHLIGHT on Tuesday that the tournament could not have been sanctioned, as it will clash with the inter-community/league championship, slated for February 2, and that the SVG Over 35 organisation has the mandate to organise such competitions. 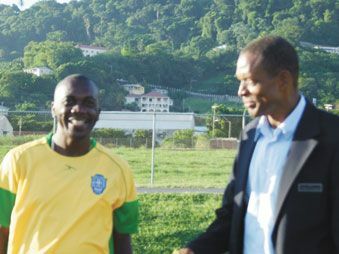 While SEARCHLIGHT was in contact with Huggins Tuesday, he noted that the executive was holding a meeting with the SVG Over 35âs organisation to finalise the hosting of their sanctioned tournament in conjunction with the SVGFF, also set to commence February 2013.
âWhy would the SVGFF want to get involved in Masters 40 â Masters Tournament? â¦ Why not put their time into youth development â grassroots football?â John said. John said there is something is sinister about the whole affair, since teams in his planned tournament have been notified. âI am wondering if it is because I opposed Mr Coombs in the elections â¦ This is really amazing because there is no plan â¦ The teams have not been sensitised about this upcoming tournament â having not played since 2010 â¦ My organisation had an invitational competition up to last Easter,â John said. âI explained that this tournament is an invitational tournament â¦ It can be completed within 20 days â¦ Over $10,000 will be put into this tournament, which will go into the pockets of footballers, officials and others who are involved in the sports,â John further added.